There is a continuing need to fortify SRM’s financial position in order to expand the Society’s involvement in rangeland activities. 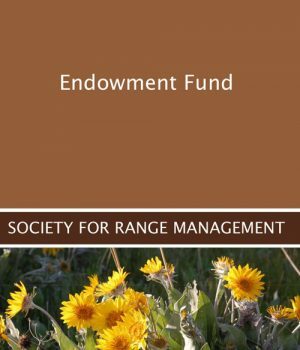 The Society for Range Management Endowment Fund was expressly established in 1982 to underwrite a strong financial position for the Society. It is a vital element in continuing to achieve the established goal and ideals of the Society – conservation, development and sound management of rangelands worldwide. The Endowment Fund serves both the immediate and future needs of SRM. Contributions to the Endowment Fund go entirely to the corpus of the fund. The Endowment Fund is unrestricted, which requires that the corpus remains intact and that only its earnings may be expended. Thus, contributions to the Endowment Fund support activities now but also into the future. In 2016 the corpus of the Endowment Fund exceeded $880,000 and contributed $22,000 to SRM’s operation and projects. Contributions can be made by credit card by going to the donation page or by sending a check made out to SRM Endowment Fund to Society for Range Management, 6901 S Pierce St, Ste 230, Littleton, CO 80128. If you would like to make a legacy gift to the SRM Endowment Fund, please contact Jess Peterson SRM Executive Vice President at 202-870-3867. You can also make significant contributions to the future of SRM through legacy giving. You have devoted your time, your energy and your heart to perpetuate and advance the programs of SRM. Your personal interest and dedication can be directly sustained through the giving of property and/or other assets to the SRM Endowment Fund. No document expresses a person’s appreciation of life more deliberately than his will. By your will, you can provide for the person closest to you and for the causes in which you are most interested. A bequest to SRM would benefit many future generations by providing the Society with the means of furthering, in perpetuity, those conservation objectives to which you have devoted such an important part of your life. You can define the extent of a bequest in your will by A) stating a dollar amount, B) designating property you wish to give to SRM, or C) bequeathing to SRM what remains after the rest of the will has been carried out. The simplest way to make a gift to SRM is to write a check. The full amount qualifies as a gift tax deduction and will come from the top of your income — the part which would be taxed most heavily. Further, your gift immediately starts doing the good you intend. The ceiling on your income tax charitable deduction is now 50% of gross adjusted income for gifts to qualified charitable institutions, such as SRM. The gift during the donor’s lifetime will often give rise to more favorable tax consequences than a gift made by will. A deduction against income usually frees Endowment Fund giving options 4 more money than a deduction from a decedent’s estate. The donor’s taxable estate upon his death will be less because of the gift. Another important way to make a substantial gift is by giving SRM land or securities. If there has been appreciation in value, you pay no capital gains tax and you can also save a sizable amount on your federal income tax for one or more years. An alternative is to sell appreciated assets to SRM for what they cost you. Your gift is the difference between your cost and the current market value. Such a gift qualifies for a charitable gift deduction and you also realize a reduction in capital gains tax. You can take out a life insurance policy on your life (or reassign an old policy which has served its original purpose) and irrevocably designate the SRM as owner and beneficiary of the policy. The value of the policy as of the gift date is deductible from your income tax for that year. Any premiums subsequently paid on the policy are deductible in the years in which they are paid. The proceeds from the policy will not be a part of your taxable estate. When you contribute a life insurance policy, you are not obligated to continue paying premiums. If you discontinue SRM may either continue paying the premiums or surrender the policy for its cash value. You can give a portion of your assets to SRM during your lifetime but retain the income o ruse of these assets for the rest of your life (and if desired, for the rest of your spouse’s life as well). A common method of doing this is by establishing a trust. There are many forms of trusts which can be established to assure income and security for you and your beneficiaries and, at the same time, provide a meaningful gift to SRM. Your lawyer and financial advisor will be able to devise the trust arrangement which will best meet the desires you have for giving to SRM. Trusts can provide many advantages in income, capital gains, and estate tax savings and in other aspects of estate planning and conservation. To properly recognize the individuals and organizations who share this deepened concern and commitment to guaranteeing our continuing effective efforts over the long term, honor groups have been formed which we hope will eventually be joined by all our friends and organizations. Trail Boss Club: Individuals, organizations, and sections who make contributions in excess of $1000 become a member of the Trail Boss Club. Contributions of $10,000 or more will have their photograph displayed on the SRM website. President’s Club: Individuals, organizations, and sections who make contributions of $100 to $499 become members of the Century Club. Each donor will be appropriately recognized. All contributions are cumulative toward the next highest level. For example, a donor who contributes $10 per year for ten years will become a member of the Century Club. Special gifts: Memorial gifts and gifts to honor the living are particularly suitable for remembering friends and relatives who’ve shared your deep beliefs in conservation, development, and self-government. Your contributions to the Endowment Fund can be in cash, securities, insurance policies, land bequests or a combination of these. All gifts, whatever the size, are recorded in the permanent record book held by the SRM headquarters.